It’s not even summer yet, but it’s damn hot. 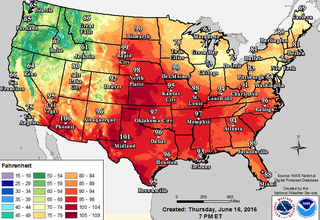 A very large portion of the country is currently simmering in heat of 100 degrees or higher, and it could get even hotter. Many cities in the Southwest and Midwest are preparing to break records this weekend and through Monday, including the US’s all-time June record of 129 degrees in Death Valley, California (not far from where horrific wildfires are burning). Plus, it’s pretty early in the season for cities to be recording such high temperatures. The way we measure the intensity of a high pressure ridge is “geopotential height.” It’s the height at which 500 millibars is measured in the atmosphere (pressure decreases as you go up). This weekend, 500-millibar geopotential height is expected to be outside our normal climate range, according to large group of computer model simulations. In other words, the models predict this ridge will be more extreme than anything observed in this particular climate data set that dates back to 1979. Not surprisingly, although these heat domes are rare, they’re becoming more frequent in recent years. The Middle East suffered beneath one last summer that generated the second-highest heat index ever recorded on Earth. So, basically these are the Beyond Thunderdome of heat domes.